For this image I looked at some vintage labor rights posters and this fist has been drawn and re-drawn in many different posters, its such a graphic icon when we think of unions and workers rights, so I thought it was a fitting visual. The second I found the word for steely blue I knew exactly what to draw! 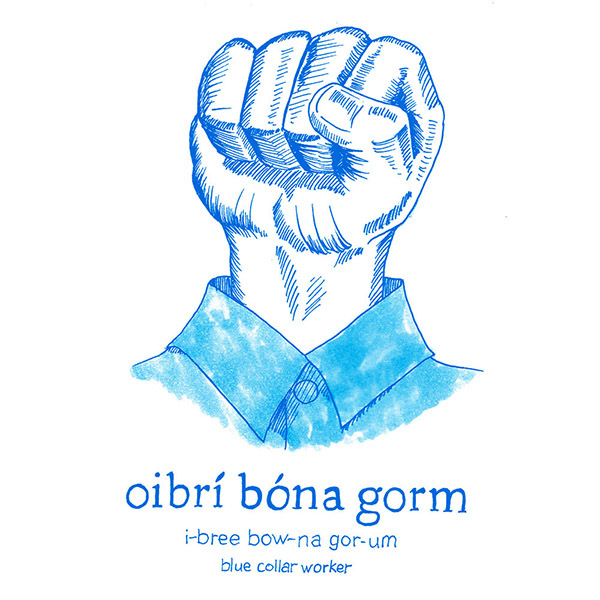 'glas' is grey in this context and 'ghorm' blue is, in my oipionion, how to describe Derek Zoolander's signature modeling pose 'as gaeilge' / in Irish! I may not have fully captured that fabulous pout but I think he's recognizable :) I guess i'll just have to practice my 'glasghorm' some more in the mirror! Little green men were so 20th century! These days in sci-fi if its not your phone trying to kill you then its 'eachtrán gorm' blue aliens. Of course Avatar's super tall striped blue 'eachtrán' were the first to jump out at me for this project, but I do see this type of blue phosphorescence turning up throughout sci-fi, its the colour palette of choice. I found 'eachtrán' from the wikitionary to describe a science fiction alien, something or someone alien is eachtrannach on teanglann.ie, but I really wanted a word for more of a imagined space alien.